Seasonal forecast for winter of 1997/1998 with 46LCAM (Ensemble member with a sudden stratospheric warming). This is a 4 month forecast of surface geopotential height anomalies (shown with surface relief and contour lines) and surface temperature anomalies (shown with a color gradient). The forecast starts on Dec 1, 1997, and goes through the end of March, 1998. It illustrates the negative North Atlantic Oscillation (NAO) pattern that gets triggered by a stratospheric sudden warming. The North Atlantic Oscillation (NAO) is a major fluctuation in atmospheric pressure over a large area in the northern Atlantic Ocean, and it affects weather conditions in the United States, Europe, and Asia. Stratospheric sudden warmings typically produce negative NAO patterns at the surface. A negative NAO is often associated with colder conditions in eastern North America and northern Europe brought on by more-frequent intrusions of Arctic air. This research was enabled by NCAR’s Computational and Information Systems Laboratory (CISL) compute and storage resources, including 700 hours on Yellowstone, a 1.5-petaflops IBM iDataPlex supercomputer with 72,288 processor cores. Community Atmosphere Model (CAM) is the atmospheric component of the Community Earth System Model (CESM). 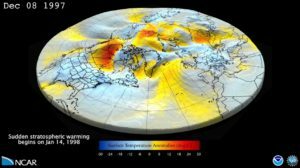 CESM is a fully-coupled, global climate model that provides state-of-the-art computer simulations of the Earth’s past, present, and future climate states. CESM is sponsored by the National Science Foundation (NSF) and the U.S. Department of Energy (DOE). NCAR is sponsored by the National Science Foundation Copyright 2016 Any opinions, findings and conclusions, or recommendations expressed in this material are those of the author(s) and do not necessarily reflect the views of the National Science Foundation.